National park with a size of 35.000 square km, located in the southeast of the state Bolívar, south of the longest river of Venezuela, Rio Orinoco and in the oldest geological formation of the world, the Macizo Guayanés. In the Gran Sabana dominates a tropical-moist climate with 4 ° to 24 ° Celsius, the vegetation reaches from herblike up to deciduous woods. The main attraction in the national park are the impressing waterfalls and rivers. But also the imposing plateau mountains with their upright walls, the Tepuyes, bewitch every natural lover. 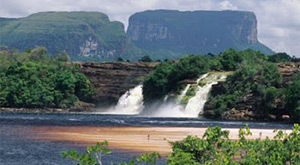 The largest of them is El Roraima, 2700 meters high. Here you can find a great variety of fauna and flora of which some kinds are endemic.